On September 10th, Liverpool play at Anfield for the first time this season as they play host to the Champions, Leicester City. After playing their first three matches of the season away from home because of renovations to Anfield, Jurgen Klopp’s side will finally get to play in front of their home fans again. Both teams have got off to sup-par starts this season. After a huge 4-3 win away to Arsenal, Liverpool have only one point from their other two matches this season. Leicester are also on four points after an opening day loss to Hull City, a draw to Arsenal, and a win over Swansea City. Comparing the odds for the game on sites like BigFreeBets shows that there’s nothing between these sides and they’ll both be looking to right their seasons as quickly as possible, and a win here would do wonders for either side. Despite it being early September, Liverpool have already amassed quite a long injury list. Ragnar Klavan looks set to miss out against Leicester along with Mamadou Sakho and Joe Gomez. Along with those absences, Emre Can is reportedly a doubt going into the match. Luckily, Sadio Mane looks like he will be fit, despite picking up an injury during the international break. On the other hand, Leicester could be looking at having a full squad. Despite all three going into the international break injured, Kasper Schmeical, Jeffrey Schlupp, and Nampalys Mendy are all reportedly going to be fit for the match this weekend. Liverpool were one of only two teams to beat Leicester in the Premier League last season. Prior to their loss to the Foxes in February, Liverpool had been unbeaten in their last seven matches against Leicester, winning five of them. Liverpool have conceded six goals in their first three games of the season, tied with Watford and Stoke City for worst in the league, despite having conceded only 7.7 shots per game, third best in the league. Despite only playing two games for Liverpool, Sadio Mane is already becoming one of Jurgen Klopp’s most influential players. The Senegalese winger made his impact felt immediately tearing Arsenal’s defense to shreds on his debut. His ability to run in behind, run with the ball, and get into good goalscoring positions from wide are all key for Liverpool going forward. On top of that, so far he has shown that he is more than a competent presser and can fit well into Jurgen Klopp’s system. Mane’s fitness is a big plus for Liverpool this week and going forward. For Liverpool to get into the top four they’ll need a lot of things to go right, and one of those things is for Sadio Mane to be firing. Leicester City’s title winning season was an achievement like we haven’t seen in a long time, if ever. Repeating it will be an incredibly tough task. To do so they’ll need Jamie Vardy to score the way he did last season. The Englishman opened his tally for the season against Swansea in the Foxes 2-1 win. He scored twice in Leicester’s win over Liverpool last season, and he’ll likely need to play well if the Foxes are to beat them again. Last season Leicester were playing as if they were straight out of a fairy tale. It’s far too early to draw any real conclusions, but they have started somewhat slowly. They’ll struggle to stop their slow start at Anfield. Liverpool will likely come out fired up for their first home game, and are arguably the better team on paper anyway. 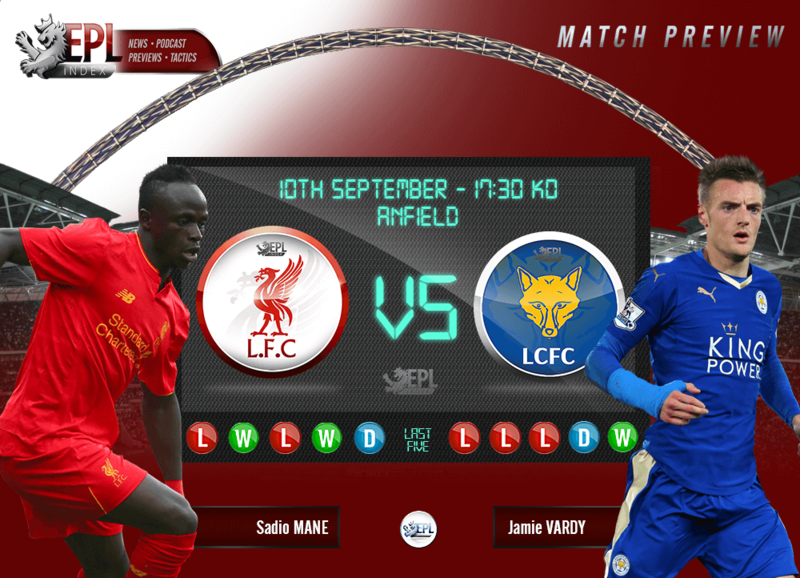 Categories: EPL Index Featured Article, EPL Index Match Previews, Leicester City, Leicester City (N), Liverpool, and Liverpool (NN).' 'Tags: english Premier league, English Premier League Opta Stats, English Premier League Stats, EPL, EPL Index Match Previews, EPL Match Preview, epl opta stats, EPL Previews, EPL Stats, EPLIndex Match Preview, EPLIndex Match Previews, LCFC, Leicester, LFC, Liverpool, Liverpool v Leicester Preview, Mane, premier league, premier league opta stats, Premier League Preview, and Vardy.